We’d love your help. Let us know what’s wrong with this preview of Meuse-Argonne Diary by William M. Wright. Got no sleep at all last night. About two o'clock in the morning Col. Heintzelman, chief of staff of the corps, came out and he was much pleased with what the division had accomplished and with the way they had gone through. It was the division's first battle and it played a very important and creditable part. Certain things fell down. . . . The truth of the matter is the troops got away from the wire and it was impossible to keep the wire up through the tangle of barbed wire and woods. We captured 3,000 prisoners on our front alone and have lost 521. Considerable heavy artillery fire all night. The preparation fire went down promptly at 3:30, it was very heavy. . . . The barrage went down promptly at 5:30. Troops jumped off. At 7:30 thirty prisoners reported from Le Dhuy Fme., taken by the 353rd and 354th infantries. I don't understand what the 353rd Infantry is doing in there, as it is out of the sector. At 7:00 a.m. there was a distinct lull in the artillery fire. . . . I told Hanson at 8:05 to move his troops forward to parallel 86 immediately. He stated that he would get them going about 8:30, but actually did not get them started until about eleven o'clock. I sent for him on arrival and told him to hurry his men up. Before Lee left I had ordered the divisional reserve to move forward with its advance element on the first objective to maintain their echelonment in depth. Smyser came in at one o'clock and I ordered the divisional machine guns to the front to take position about one-half kilometer east of Dhuy Fme. At the time the reserves were ordered forward. I ordered Hanson to take his P.C. to Dhuy Fme. . . . Hanson has just arrived. I do not understand why he is always so slow. He seems to be inordinately stupid. 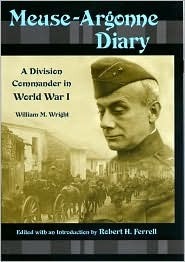 During America’s participation in World War I, 1917–1918, only a single commander of a division, William M. Wright, is known to have kept a diary. In it, General Wright relates his two-month experience at St. Mihiel and especially the Meuse-Argonne, the largest and most costly battle in American history. In the Meuse-Argonne, the Eighty-ninth Division, made up of 28,000 draftees from Missouri and Kansas and under Wright’s command, was one of the two American point divisions beginning November 1, 1918, when the U.S. First Army forced the German defenders back to the Meuse River and helped end World War I as the main German railway line for the entire Western Front came under American artillery fire. It was a great moment, and Wright was at the center of it. Robert Ferrell skillfully supplements the diary with his own narrative, making use of pertinent manuscripts, notably a memoir by one of Wright’s infantry regiment commanders. To ask other readers questions about Meuse-Argonne Diary, please sign up.